My hair is starting to fall out. It happens every time I have a baby. The good thing about long hair is I can pull it back in a ponytail. The bad thing about long hair is I can pull it back in a ponytail. Being almost FORTY and having a ponytail just doesn't go together real well. I just wish I had a lot of money and could afford a complete make over. You know, like on those TV programs where they take you to some posh salon and totally make you look fabulous. I also need a personal wardrobe shopper, because I have no fashion sense whatsoever. I wear jeans and a T-shirt and call it a day. I would love for someone with fashion sense to take me shopping. Any takers? 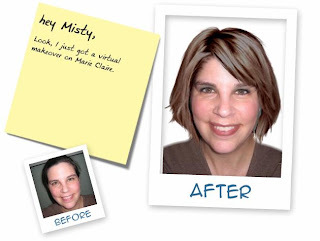 After I wrote that paragraph, I went to Marie Claire and gave myself a virtual makeover. It was so much fun. So, you like?? I am digging the haircut and color. Let me know what you think.